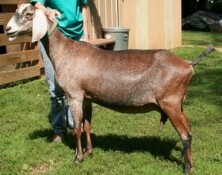 Penny is a brightly colored doe with good overall conformation. This will be the first year that she freshens here at Sol-Orr. I am very excited to have Penny in my breeding program.